If you have been thinking ahead past April about giving the Apple Watch as a birthday, anniversary or holiday gift, here is some good news. 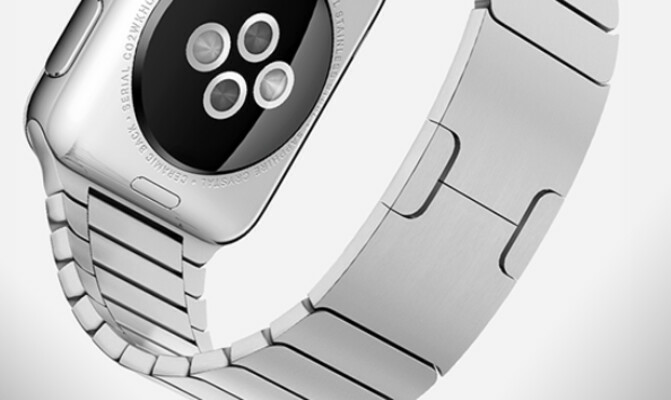 A report out of France says that Apple will allow the timepiece to be engraved with a personal message. The anonymous source cited in the report allegedly works inside Apple, but wasn't sure if this would be offered at launch or a little bit down the road. Where would the engraving go? Traditionally, a watch is engraved on the back plate. But with the Apple Watch, the heart-rate sensor is on the back which doesn't leave much room for a decent heart-felt message. Since the tech titan sees its smartwatch as a piece of jewelry as much as a technological device, giving gift givers a chance to write some pithy prose might be important to Apple. Currently, Apple allows engravings on the Apple iPod and Apple iPad. We should find out more of what Apple has in mind for its watch during the "Spring Ahead" event, aptly named after that old reminder about Daylight Savings Time (Spring Ahead, Fall Back) which returns in the U.S. this coming Sunday. Besides more information about engraving, we should find out pricing for the mid-range and top-of-the-line models, information about battery life and how resistant the watch is to water. And most importantly, we should hear about a specific launch date for the Apple Watch. Wow huge news!! Now it's not so ugly. Slow news day I guess. Wow, you don't have to take it to a jeweler now. Although most jewelers will do it for next to nothing nowadays. Also Apple criticized Motorola for their customization of the Moto 360 MotoMaker that will offer the same thing. Apple has done personalized engravings on items since my first iPod in the early 2000s, and for free, at that. The lackluster iWatch design shows that Apple is losing its touch. While I think the Moto 360 is the best looking smartwatch, I wouldn't say the iWatch has a lackluster design. It looks cool, but Apple could have made it look FAR better. Of course you think it looks cool. You're an Applesexual. The watch looks like dogs**t. No question about it. I'm sure the device will sell well, since all the nerds will buy one. Makes spotting dorks so much easier. And queers too. Real men wear round-faced watches. Well obviously round-faced watches aren't for you then. They obviously aren't for you Mxy. This is common knowledge. You mean the one you gave me that matches with yours? Please keep me out of your fantasies. What fantasy, Mxy? You even gave me the receipt so I can return it if I don't like it. If you want to use a purse then good for you. Just keep me out of it. But you said we gonna use our matching purses together...to go with our matching outfits. Don't wimp out now. You guys have never seen or own a Cartier. The iwatch is going to sell like hot cakes in Europe and Asia. Style is not American forte. I personally want one but I have two Notes. A watch is not like a cell phone. The iwatch is the only cell/watch that I would care to show on my wrist. It is superb. They bash Motorola then they do the same thing as them. I just can't believe they didn't make a circular watch. They certainly have the resources to make the most watch-like, amazing looking smartwatch on the planet. But they fell way short with that design. The 'problem' with Apple/Jony is that he follows the philosophy, form follows function. On a square screen you can show more information, thus this is the only option for a smart-watch. But in their own words, a watch is much more, it's jewelry and jewelry doesn't really have a function. But didn't Jony Ive criticized Motorola for giving the customers the option to customize their phones? So he said those things even while having practiced them to some extent already? Is that not worse? Comment number 4 ;) Jony Ive is a hypocrite, just like Steve. Phone vs watch argument I disagree with Ive's notion that designers should be left to all designing, but phone is a tool, watch is an accessory (some think differently) but that's the case. To be fair, they've offered this since before the iPhone. I could've done it on my iPod, but I'm not big on engraving personally. You haters know Apple has always offered engraving on some of their devices. Apple has always offered this while criticizing others like Motorola for offering customizations on their handsets. That's hypocrisy at its best. As I have said recently, Apple can do no wrong in your eyes. So says the one who always has his face on Chen's left cheek.